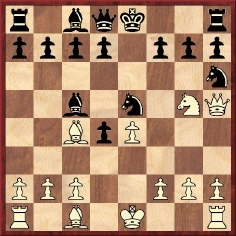 In this position the remarkable move played was 16…Rxb3, and the game continued: 17 cxb3 Nd3 18 Qg2 Nb4+ 19 Ka1 Nc2+ 20 Kb1 Bd3 21 Kc1 Ba3 22 Nb1 Qc5 23 Bxa3 Nxa3+ 24 Kb2 Nxb1 (Missing a quick mate with 24…Qc2+.) 25 Rxb1 Qc2+ 26 Ka3 Qxb1 27 Ne2 Qc2 28 Nd4 Qc5+ 29 Ka2 Rb8 30 Qg1 Qb4 31 Qc1 Bc4 (?!) 32 Qc2 Qxa4+ and wins (S. Tinsley v W.H.K. Pollock, London, 18 October 1883). Pollock v Blackburne, London, 1886: ‘Mr Pollock’s attack in this game is quite worthy of any aspirant for the highest mastership.’ International Chess Magazine, August 1886, page 245. 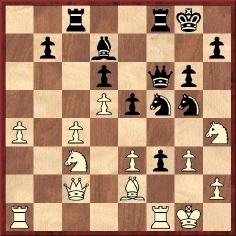 Weiss v Pollock, New York, 1889: ‘This sacrifice of the queen for no more than two pieces is based on a most profound and brilliant idea, such as has very rarely occurred in actual play.’ ‘Mr Pollock’s play from the 17th move renders this game one of the finest monuments of chess ingenuity, and altogether it belongs to the most brilliant gems in the annals of practical play.’ New York, 1889 tournament book, page 3. 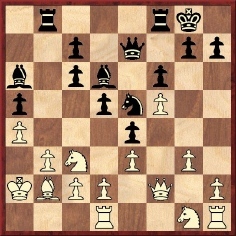 Mason v Pollock, New York, 1889: ‘A regular gem of a game on Mr Pollock’s part. 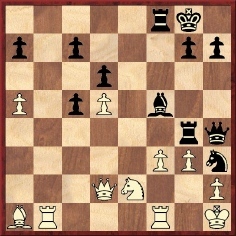 The termination is charming.’ New York, 1889 tournament book, page 319. Haller v Pollock, St Louis, 1890: ‘A charming termination to a beautifully played game.’ International Chess Magazine, February 1890, page 57. 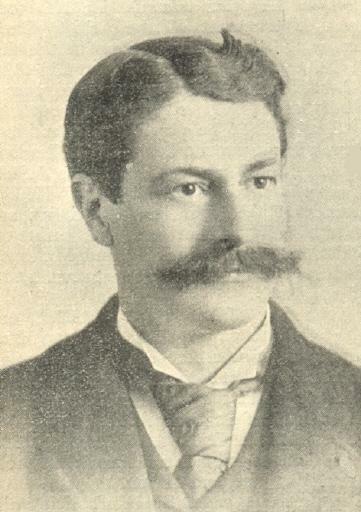 A posthumous distinction for Pollock was being one of the very few players to be the subject of a biographical games collection in the nineteenth century. In 1899 Mrs F.F. 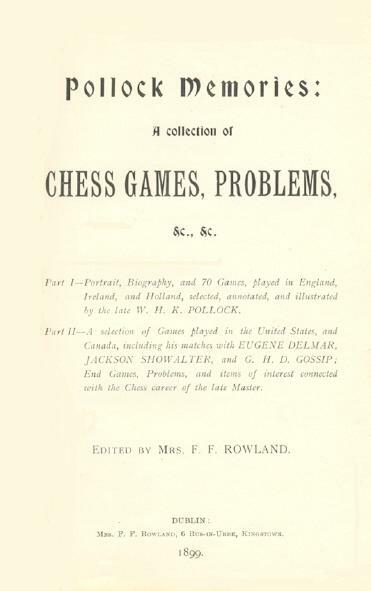 Rowland of Kingstown, Ireland brought out Pollock Memories: A collection of Chess Games, Problems, etc. etc. A copy lies open before us now, inscribed by her in 1903, and from it we cull some specimens of Pollock’s ingenious play. The focus here is on brilliancies, many from offhand games, which are seldom seen nowadays. 25 Bf1 Bxe6 26 Rxg8+ Bxg8 27 Re2 Qh4 28 Rxe7+ Kd8 29 Qe2 Qg5+ 30 Bg2 Qxf5 31 Bd6 Qg6 and ‘White mates in four moves’ (though it is actually mate in three, with 32 Rd7+). 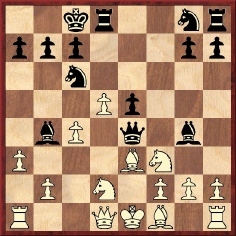 27…Bxb1 (Here Pollock wrote with understandable pride, ‘It is rare indeed that we meet with a case where one party, in a winning combination, sacrifices queen, rook and knight in three successive moves.’) 28 gxh4 Rxf3 29 Rxf3 Nf2+ 30 Rxf2 Be4+ 31 Rg2 Rxg2 32 Nc3 Rxd2+ 33 White resigns. 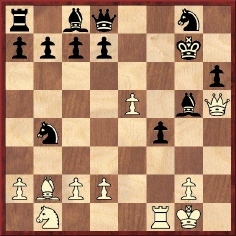 26…Be4 27 Qxf8+ Qg7 (Seldom has the only legal move been so attractive.) 28 Rf3 Bxf3 29 Bxg7+ Rxg7 mate. The earlier moves were: 1 e4 e5 2 Nf3 Nc6 3 d4 exd4 4 Nxd4 Bc5 5 Nb3 Bb6 6 Be2 d6 7 O-O Nge7 8 Nc3 O-O 9 Na4 f5 10 Nxb6 axb6 11 exf5 Bxf5 12 c3 Be6 13 f4 Kh8 14 a3 Qe8 15 Nd2 Nd5 16 Ne4 Bf5 17 Nxd6 cxd6 18 Bh5 g6 19 Qxd5 gxh5 20 Bd2 Qg6 21 Rae1 Rae8 22 c4 Kg7 23 Bc3+ Kh6 24 Rd1 Re2 25 Qxd6 Rxg2+ 26 Kh1. Source: The Book of the Counties’ Chess Association by A.B. 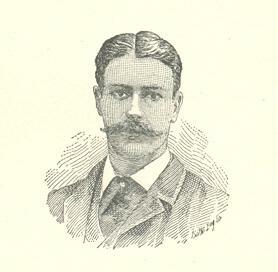 Skipworth (London, 1886), page 77. 28…f6 29 e5 Nf5+ 30 Kxh7 Nxe5 31 Qh3 Bd3 32 Rae1 Nh6+ and wins. 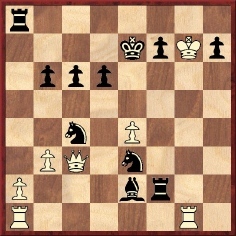 If 33 Qxd3 Black wins with 33…Rh2. Even so, the conclusion is strange, and an inaccuracy in the final part of the game-score cannot be ruled out. 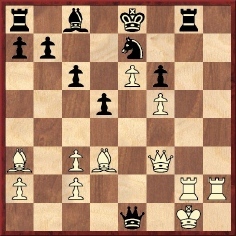 16 Bc1 Nxa3 17 Nxd5 exd5 18 e6 fxe6 19 Bxg6+ hxg6 20 Qxg6+ Kf8 21 f5 exf5 22 Re6 Resigns. 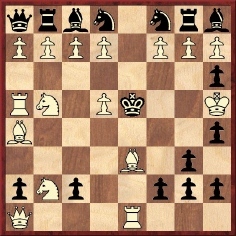 7 Ne6 Bb4+ 8 c3 Nd3+ 9 Bxd3 dxc3 10 Nxg7+ Kf8 11 Bxh6 cxb2+ 12 Ke2 bxa1(Q) 13 Rxa1 Qf6 14 Ne6+ Kg8 15 e5 Qxe6 and White mated in three moves. The following game is an excellent illustration of pins. 9…Nd4 10 Be2 Bxd2+ 11 Nxd2 Nc2+ 12 Kf1 Qf5 13 Bxg4 Nxe3+ 14 Kg1 Nxg4 15 f3 Qd3 16 fxg4 Qe3+ 17 Kf1 Rf8+ 18 Nf3 e4 19 Qe2 Qxe2+ 20 Kxe2 exf3+ 21 gxf3 Nf6 22 Rhd1 Re8+ 23 Kf2 Rhf8 24 Kg3 Re3 25 Rd4 Nd7 26 Rf4 Rxf4 27 Kxf4 Re2 28 h4 Rxb2 29 Re1 Kd8 30 Re3 Rc2 31 White resigns. 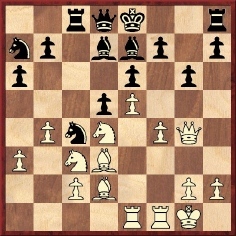 1 e4 e5 2 Nf3 Nc6 3 Bc4 Nf6 4 Ng5 Nxe4 5 Nxf7 Qh4 6 O-O Bc5 7 Nxh8 Nxf2 8 Rxf2 Qxf2+ 9 Kh1 d5 10 Bxd5 Bg4 11 Bf3 Bxf3 12 gxf3 Nd4 13 Qg1 Qxf3+ 13 Qg2 Qd1+ 15 Qg1 Qxg1+ 16 Kxg1 Nxc2+ 17 Kf1 Nxa1 18 White resigns. 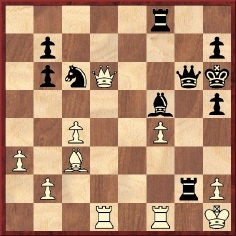 15 Rxf4 Bxf4 and White mated in eight moves. At move 20 in the game below, Steinitz referred to the continuation as an ‘intellectual treat’. 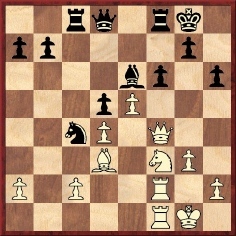 20 Nh4 Bh3 21 Nf5 Bxf1 22 Qg4 Kf7 23 Qxg7+ Ke6 24 Rxf1 Rc7 25 Ne7 f5 26 Rxf5 Rxe7 27 Qxf8 Qxf8 28 Rxf8 and wins. 30 Rxf3 (‘If 30 Nxf5 Bxf5 31 Bd3 f2+, etc.’) 30…Nxf3+ 31 Nxf3 Nxe3 32 Qb1 Nxc4 33 Ne4 Qd8 34 Qxb7 Na5 35 Qb4 Bg4 36 Rf1 Bh3 37 Re1 Rb8 38 Qxd6 Qxd6 39 Nxd6 Rb2 40 Bd1 Rg2+ 41 Kh1 Rf2 42 Ne4 R2xf3 43 Bxf3 Rxf3 44 d6 Rf1+ 45 Rxf1 Bxf1 46 Kg1 Bd3 (‘Not 46…Bh3 on account of 47 g4.’) 47 Nf6+ Kf7 48 Nxh7 Ke6 49 Kf2 Kxd6 50 Ke3 Bc2 51 h4 Nc4+ 52 Ke2 Kd5 53 g4 Kd4 (‘The ending is a good one for the ‘gallery’; either the king or pawn must advance with immediate effect.’) 54 Nf8 Bd3+ 55 Ke1 Ke3 56 h5 gxh5 (‘Unnecessary; Black has a mate in four moves here.’) 57 gxh5 Be2 58 Nd7 Na3 59 White resigns. It is instructive to compare the above notes with those by Pillsbury in the Hastings, 1895 tournament book (edited by Horace F. Cheshire) and, for a modern view, with the annotations of Colin Crouch in the 1995 monograph on the tournament which he co-wrote with Kean Haines. Pillsbury’s final note read, ‘Rather an amusing finish to a very interesting game’. 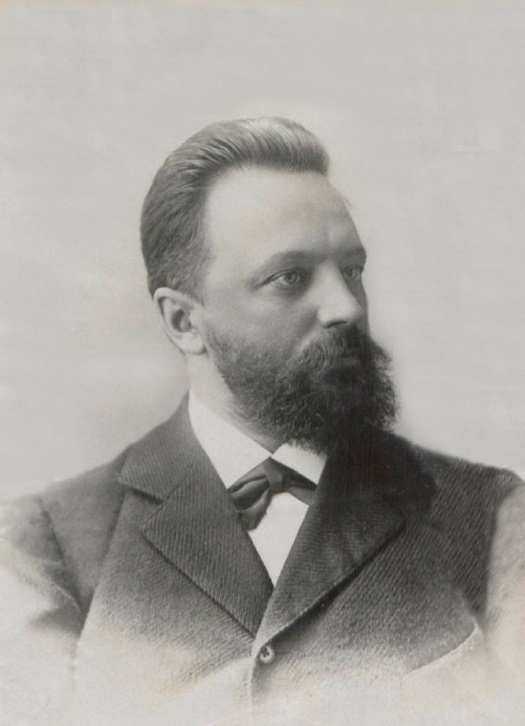 Who, then, was this man who gathered many scalps yet seemed primarily concerned with playing exquisite chess and regularly switched to what today would be called ‘hacking mode’? William Henry Krause Pollock was born in Cheltenham, England on 21 February 1859, the son of the Rev. 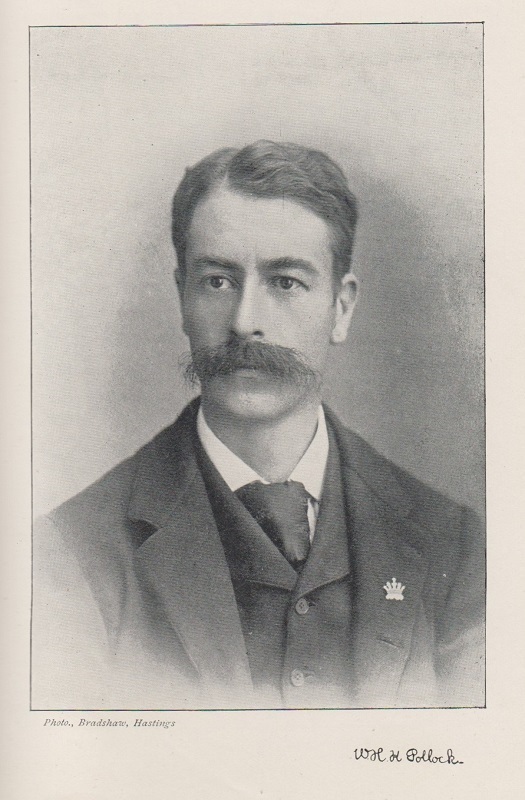 William J. Pollock, and was educated at Clifton College and Somersetshire College, Bath. 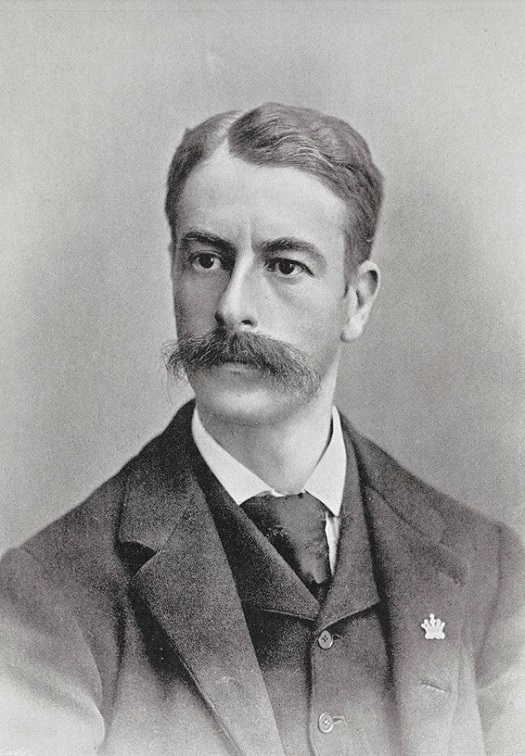 He studied for the medical profession and in 1882 qualified as a licentiate of the Royal College of Surgeons in Dublin. The same year his first published game and problem appeared in the unlikely setting of the Irish publication The Practical Farmer. As his chess strength developed he became a regular participant in British tournaments, attracting more attention for individual games than for his final standing. 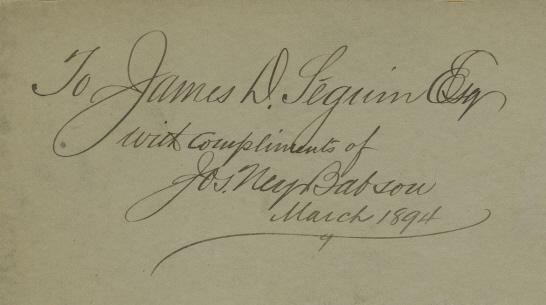 In 1889 he went to North America, settling in Baltimore, Maryland. 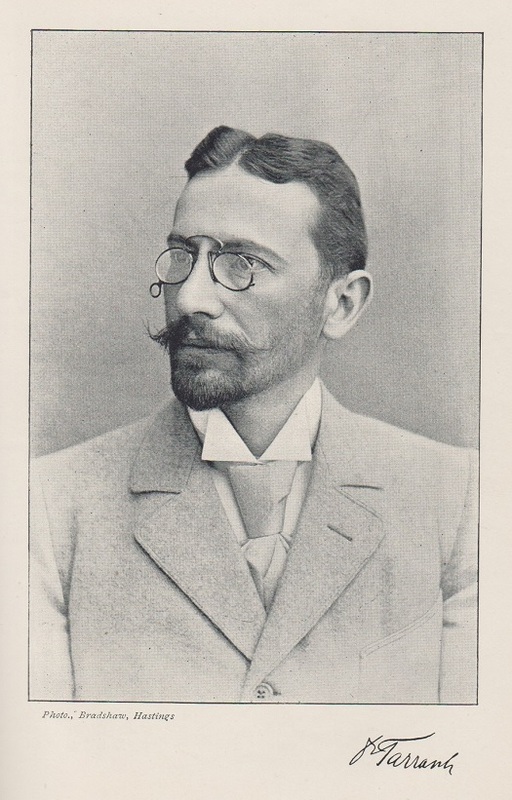 He returned to England in 1895, and the October issue of that year’s BCM (page 414) described him as ‘a tallish good-looking fellow, courteous and pleasant, with poetic fancies both in chess and words, and who sits far back with arms resting on his knees and face almost touching the board, so that it seemed hardly possible for him to view the whole’. 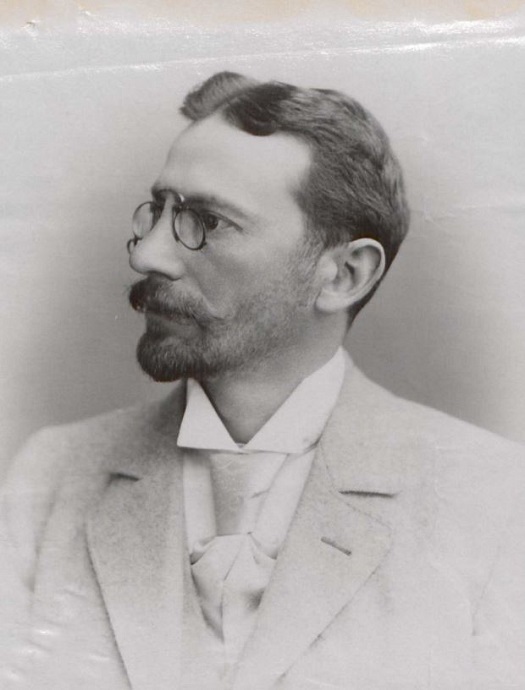 He was indeed an accomplished writer, although he left only one book, on the St Petersburg, 1895-96 tournament, jointly written with James Mason. Pollock died at 5 Berkeley Square, Clifton, Bristol on 5 October 1896. He was 37. The position is illegal but provides a stiff challenge. 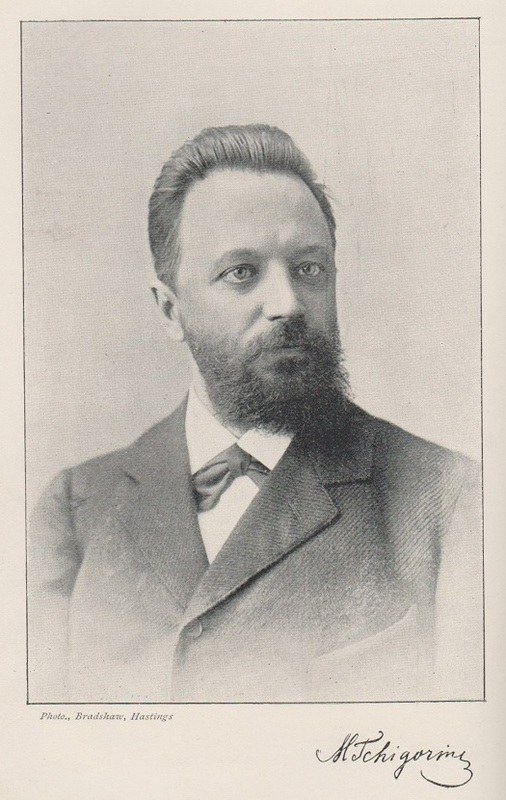 Mrs Rowland’s book (page 158) reported that ‘this very peculiar and highly original problem was composed by Mr Pollock on the occasion of giving a lesson on the art of composing at the Baltimore Chess Association’. Afterword: The above article first appeared at the Chess Café in 1998 and was included in A Chess Omnibus (pages 227-233). In the latter source we mentioned that Pollock Memories was reprinted by Moravian Chess, circa 2001. The short game Pollock v Hall was discussed in C.N. 9185. Page 5 of Chess Quotations from the Masters by H. Hunvald (Mount Vernon, 1972) gave Pollock’s above-mentioned observation ‘It is no easy matter to reply correctly to Lasker’s bad moves’ but labelled the source as ‘Anonymous’. Just received: W.H.K. Pollock. 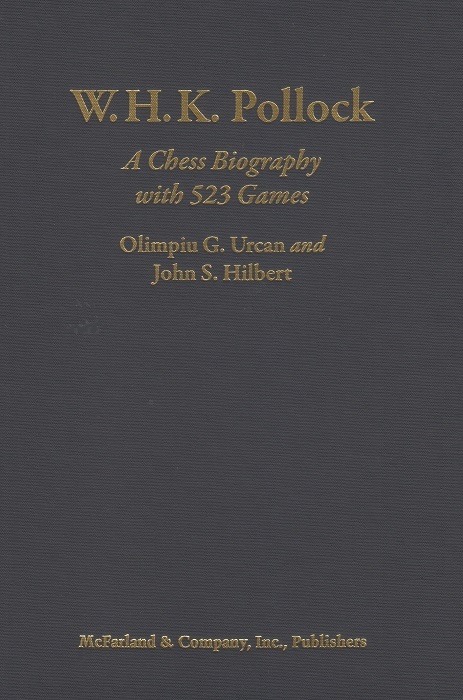 A Chess Biography with 523 Games by Olimpiu G. Urcan and John S. Hilbert (Jefferson, 2017). On page 466 the co-authors quote this passage, praising it as ‘perhaps best summing up Pollock’s finest traits as a chess player’. The Pollock book is one of the finest in the entire McFarland catalogue. 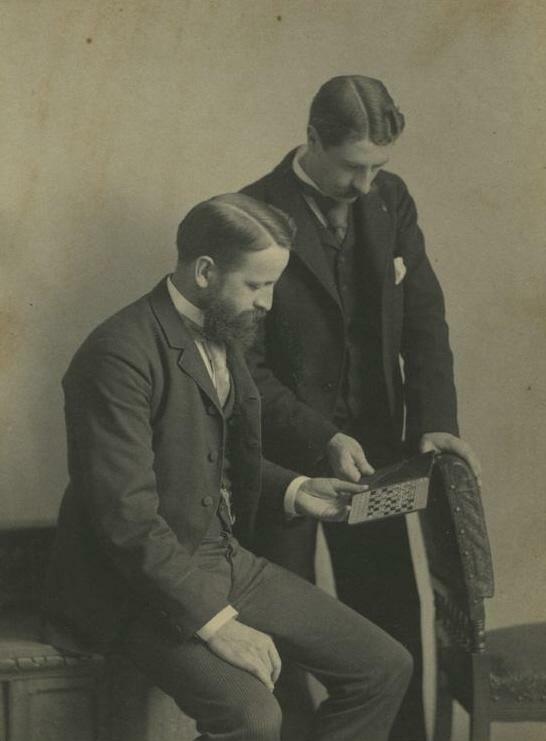 Our book also has photographs of Chigorin (page 58) and Tarrasch (page 185) taken during the Hastings, 1895 tournament by William James Donald. They are different from the Bradshaw photographs opposite pages 121 and 60 respectively of Cheshire’s book.